The day started with Ferrari president Luca Di Montezemolo saying the new Formula 1 had reduced its participants to "taxi drivers", and the sport's impresario Bernie Ecclestone saying its audience found it "unacceptable". It ended with egg on the face of two of the sport's most powerful men, as Lewis Hamilton, Nico Rosberg and the rest of the field produced a Bahrain Grand Prix that will go down as one of the most thrilling races in history. Flat out from beginning to end under the lights in Sakhir, Hamilton and Rosberg repaid the faith of their bosses at Mercedes Grand Prix, who had promised they would let them race without interference from team orders and were true to their word. And this was another thumb in the eye for Di Montezemolo, whose Ferrari team famously operated a policy of total backing for Michael Schumacher, not letting his team-mate challenge him, no matter what their advantage over the rest of the field. The gap between Mercedes and the rest compares with any Ferrari had through that dominant era, and at this early stage of the season it is hard to imagine anyone getting close enough to challenge them. "Rosberg was faster than Hamilton in Bahrain - turning the tables from a week ago in Malaysia - but the Englishman's race-craft in defence was utterly flawless"
Mercedes are not working on that basis. They are pushing all out, as they have to, on the assumption that sooner or later they will be caught, not least because the potential gains this early in a complex new set of regulations are greater than normal. The temptation, one that Ferrari fell prey to in the Schumacher era, is to focus on the main prize, the championship, and not to take the risk of letting the drivers go at it out on the track. It is to Mercedes' eternal credit, then, that they have decided not to do that, rather to trust Hamilton and Rosberg to be mature, to race hard, but respect the limits. 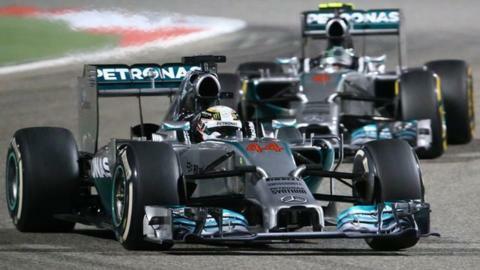 "We were on the knife-edge in that race, and the risk increases," Hamilton said afterwards. "Maybe next time we'll come back a bit, but I was not letting up today. It was close, but we didn't damage each other's races. The team put that trust in us, which was great." The result was an utterly captivating display of great race driving by two of its finest exponents. Rosberg was faster than Hamilton in Bahrain - turning the tables from a week ago in Malaysia - but the Englishman's race-craft in defence was utterly flawless. "I thought I'd got him about nine times but they didn't work," Rosberg said. "He always got the run back on me and he did a good job. That's it. Lewis is obviously a great driver and made it work." On the Mercedes pit wall, things were tense. Did you have any doubts about letting them race, co-team boss Toto Wolff was asked? "Turn Three at the start of the race," he replied, in reference to Hamilton's grasping of the lead from his team-mate. "I was like, 'Please, not for the next one and a half hours now.'" As the race unfolded, it seemed Hamilton had done enough, after weathering Rosberg's attacks in the run-up to the first pit stops. Rosberg switched to a different tyre strategy to give him the best chance of passing Hamilton at the end of the race, using the slower 'medium' tyres in the middle stint and saving the faster 'softs' for the end. Hamilton used the 'softs' in the middle of the race and built what looked like being a winning advantage, but the safety car wiped it out. That meant he was faced with defending his lead for the final 10 laps against a team-mate in a faster car and with grippier tyres. Hamilton employed all his skills to keep Rosberg at bay, fending off attack after attack with consummate skill, aggressive but always fair in defence, before finally edging clear in the last couple of laps as Rosberg's tyres lost their edge. It was undoubtedly one of Hamilton's greatest drives. The race was effectively a test case for Mercedes' no-team-orders approach to the season, and Hamilton and Rosberg repaid their bosses' trust handsomely. All the same, Wolff's co-team boss Paddy Lowe, who is responsible for all the sporting and technical aspects of Mercedes GP, admitted it had been a "big relief" that had been the case. For Lowe, though, Mercedes have a wider responsibility than just to themselves. "Imagine if we'd imposed team orders from lap two or something," he said. "What a terrible thing that would be for F1 and the Mercedes philosophy in motorsport. "That's what I'm here for," said Rosberg, "for racing like that. It was a good day for the sport, after all the criticisms. I think they will be quiet tomorrow, which is a good thing." "It is something we owe to ourselves and the sport. And to the drivers. They are professionals. You want to give them the opportunity to race." Throughout the field, but a long way behind the Mercedes, drivers were doing the same thing, as the Force India, Red Bull, Williams, Ferrari and McLaren cars fought for supremacy. It is hard to think of a grand prix in which there has been so much wheel-to-wheel racing between so many drivers for so long. All this in the third race of a new formula, which is founded on the philosophy of efficiency, at one of the toughest tracks for fuel consumption all year. So much for "taxi driving", an "economy run", the new era being "not F1", or there being a lack of spectacle. Ecclestone and Di Montezemolo both left Bahrain before the end of the race, so their thoughts on this superlative advert for the sport they have spent so much time deriding in recent days are not yet known. It was left to Rosberg, defiant and dignified in defeat, to sum things up. "That's what I'm here for," he said, "for racing like that. It was a good day for the sport, after all the criticisms. I think they will be quiet tomorrow, which is a good thing."